What makes our custom name plates different? So, you’ve just moved into a new office and got promoted. That’s great! You get to enjoy your success and upgrade your space. 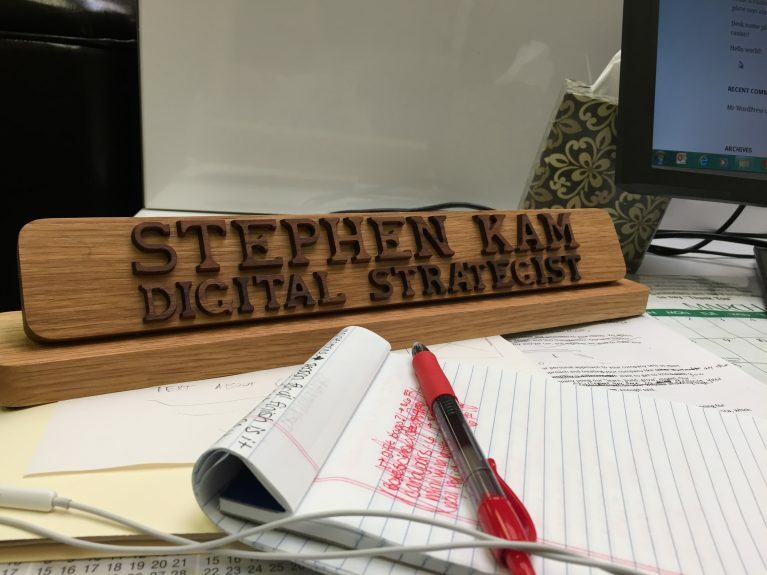 When you move into your office, you probably have a bunch of your personal items that you’ll move with you, but there is also a good chance that your nameplate will be outdated and have your old title on it. Even if it isn’t outdated, it may be made of plastic and look cheap. A new custom name plate will tie your whole office together and make it look like home. That’s why you should consider buying a custom name plate from nameplates.biz. Our nameplates are made from the highest quality hardwoods: oak and walnut. The hardwoods will stand up to the test of time and the differences in color between the lettering and plate will help your names stand out and become the focal point of the piece. We start making our name plates from scratch with woods from Arkansas and the Midwest. We’re also proud to say that our nameplates are made completely in the USA. The wood is preserved with an oil finish that enhances the wood naturally and brings out the beauty in the wood. The lemon in the oil also helps to preserve the wood for years to come. You can easily build your custom name plate online, where we will create the name plate to look exactly how you see it on your screen and we offer many different professional symbols, such as law and medicine. If you are having trouble deciding on a nameplate design online, don’t hesitate to give our friendly employees a phone call. They will be happy to help you design the nameplate that will be perfect for you and your office. We know that our custom name plates will become a centerpiece of conversation and will mirror all of the hard work you put into your company. Let us help you have a custom name plate that will not only show you off, but will make your office look more professional and aesthetically pleasing. We know that you will love our high-quality products, and we can’t wait to make your office vision a reality. Treat yourself with a custom name plate from nameplates.biz. Get started by building yours online today!